06 Can you change your mind later? • Make referenced files managed: First, select all the referenced images you want to import, then Use the File > Consolidate Originals command. Aperture will then import all these referenced files into its own internal library. The pictures you import can be from different albums, smart albums, projects and folders, and you don’t have to specify an import project. It’s a straight replacement – your image will stay in the same albums and projects they were in before, except now they’re managed not referenced. • Make managed files referenced: You use this if you want files currently managed in the Aperture library to become referenced files in another location. Remember, one of the points about referenced files is that it means other programs can see and use them too. For this you need the File > Relocate Originals command. You can relocate all the images you’ve chosen to a single folder, which is a bit clumsy, or choose to have them separated into folders based on the current project or the image dates, which is rather clever. Don’t forget that Aperture’s Projects do not reflect real-world folder locations, so even after you’ve relocated your images, their location in your Aperture library is unchanged – they’ll stay in the same projects, folders and albums. 07 There must be an easier way to get individual pics out of Aperture? There is. Use the File > Export > Versions if you want the Aperture-edited version of your picture, or File > Export > Originals if you want the original files. So let’s say you want to batch convert some images in DxO Optics Pro: you just export the RAW files to an external folder, carry out the conversions in DxO then import the converted images back into Aperture – you don’t need the exported RAW files any more, so you can delete them. 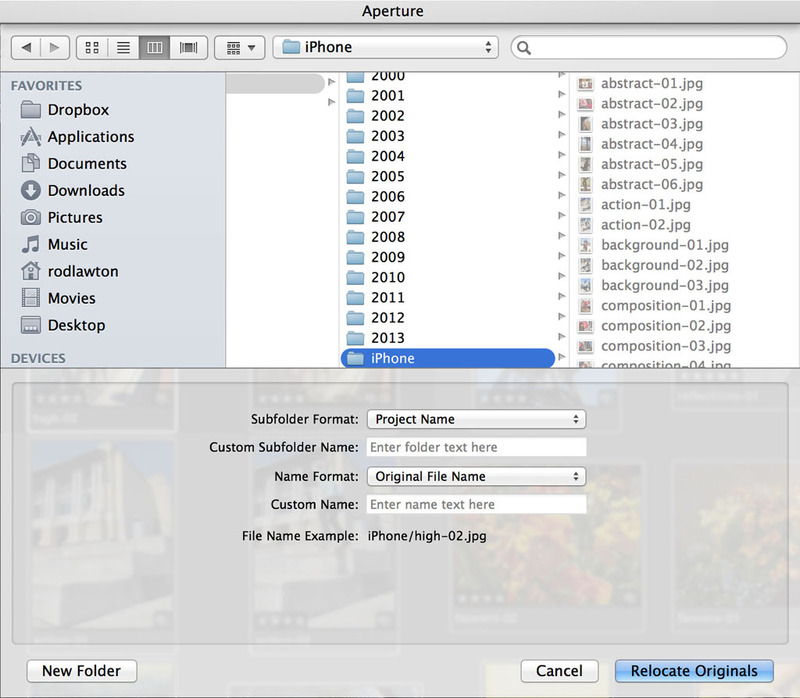 Aperture exports copies of the original files, not the originals themselves. 08 So which is best? This depends on how many images you have, how much internal storage on your computer and how fast you want Aperture to run. • Managed library pros and cons: You have just a single library file which you can copy or move wholesale to different volumes, and you know exactly where all your pictures are. It’s beautifully simple. But managed libraries become huge, too large for the average internal HD and certainly for today’s much faster but smaller SSDs. They also ring-fence your images so that the only way to view or edit them with other apps is to manually export them on an ad hoc basis. • Reference library pros and cons: Your Aperture library is much smaller and can be stored on a super-fast SSD in a MacBook, for example, while your master images are stored on an external drive – and as your library gets larger, you can simply invest in larger drives. You can carry out all your organising, keywording and previewing without the masters being present, and your masters are also visible to other applications. However, there is always the possibility that your referenced files may be lost, moved or renamed and become disconnected from your Aperture library. And if you use Photo Stream your iOS images will be managed by default – so you could end up with a mix of managed and referenced files. On balance, the referenced approach is messier, but for those with large libraries who use other applications too, referencing is the only sensible option – until the day, maybe, when 1Tb or 2Tb internal SSDs become a practical proposition. Thanks for an enjoyable site. Generally a very good article discussing managed vs. referenced files. Having taught Aperture, I know how conceptually difficult this topic can be for many users. I know I am being somewhat pedantic and that too much info can be a problem, but hear goes with a couple of comments/suggestions. I hope you are not offended. 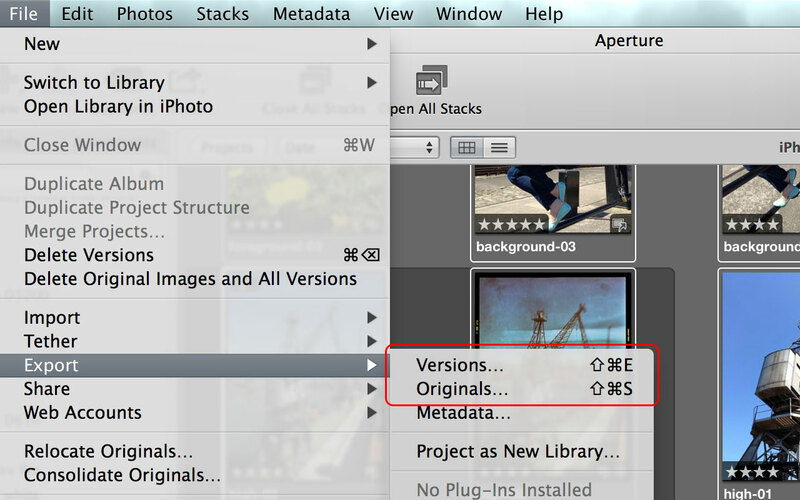 Aperture no longer uses the term “masters”, replacing it with the term “originals”. Use of the old term may confuse students. You state, “Referenced files stay in their original location, which may even be on a separate drive”. This is may confuse some users, because for most image file imports the original location is a card in a card reader. This is one of the most dangerous aspects of dealing with referenced files. In paragraph 03, you specifically recommend using the “In their current location” setting. I have personally had to tell many people they have lost their original files, because they inadvertently selected this setting, where the original location is a card. They see their images import into Aperture. They might even back up their hard drive first, because they are cautious, but in short order they reformat their card, in-camera, which was the “original” location. Oops! If you must use referenced files, I feel a better methodology is to always use the “Choose” setting, as it reinforces that you are copying the originals to a new location. I realize there may be times where the files already exist in their final resting place and the “In current location” setting is appropriate, but users must be extra vigilant to avoid mistakes when using this setting. In paragraph 07, the implication is this is the way you would use an external editor. Certainly you could do it this way and if you use multiple external editors, it is required, unless you want to change preference pains regularly, as Aperture currently supports only one external editor at a time. However, if you predominately use one external editor and/or plugins, you can set your preferences to use this external editor. Once this editor is set, it will appear as an editing option, in the Photos menu and in the control click/right click contextual menu. The advantage to this approach is that Aperture manages the export/import round trip. Less work and fewer opportunities for a mistake. I feel the topic reviewed in 08 should include discussion of a third choice, multiple managed libraries. This allows the user to address internal storage space issues without going the referenced route. There are many ways to manage this approach, e.g., a current year, plus portfolio level images library on your internal drive and an archive library on the external drive. Someone who manages a very large database of images might take a yearly library approach. A professional photographer might have a library for each customer/project. Like all approaches, there are pros and cons. I feel the biggest pro to this approach is the reduction in human error possibilities managing referenced image import and the created files in the finder. I feel the biggest con is that Aperture can only search within the open library, so a multiple library user needs to have a good system for defining libraries, or they will struggle to determine in which library an image resides. I hope this commentary is useful. Thanks again for a useful site. Thanks for those comprehensive observations, Scott. I think the one about not referencing file on a memory card is a particularly good one, and I wish I’d though of that! I also take the point about the swap from ‘masters’ to ‘originals’. I’ve been using Aperture a long time, but I hadn’t noticed that. I’ll update the post with those points in mind. Point 7 is not about using external editors and I can’t honestly see where I implied it. It’s about situations where you might want to extract a file from a managed Aperture library for use externally, for whatever reason – I think the DxO conversions I mentioned are a particularly good example. Aperture is not always the best RAW converter, and you have to resort to means like these to use another, or to send your originals to other people, for example. I think it would be better to cover external editors in a separate post. I have tried multiple managed libraries, but they don’t work at all well for me. Others may feel differently, though, so thanks for the suggestion. I really enjoyed reading your thoughts on referenced vs. managed libraries. I’ve been spending entirely too much time deciding which approach to use as I move all my images from PC to Mac. I’m a bit of a control freak when it comes to the handling of my files, so the managed approach goes against my nature. However, I’m just a JPEG-only rank amateur snapper, so I’ve decided to use iPhoto in managed mode for it’s sheer convenience. FYI, iPhoto can import photos with a managed, referenced or combo approach. 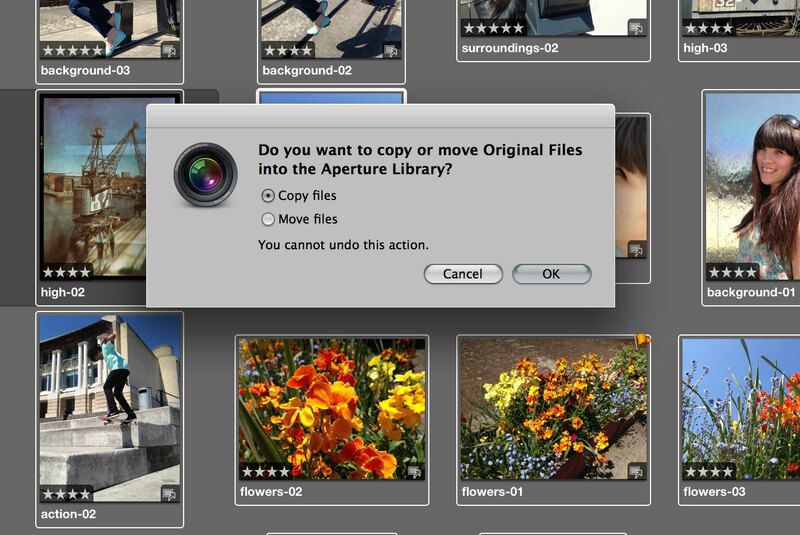 Also, iPhoto can open an Aperture library, and vice versa, so I may graduate to Aperture at a later date. I’ve also decided to do a couple things to my images before importing them into iPhoto. I use the Automator to give them a more descriptive filename with the image date and time, and I use Picasa to add geotags and keywords. That way, my iPhoto masters will have that info in them should I ever decide to break out of the Apple camp. Steve makes excellent points about the danger of using a referenced library unless you are really clear on where your images will reside. Another thing for folks using an external referenced library: If you back up your Mac with an app like Time Machine, your external drive holding your photos must be connected during the backup if you want your photos backed up, too. Thanks again for your excellent and timely article! Very informative Rod, and also Scott, your comments were very helpful. Being in a position of starting from scratch with Aperture and a Macbook Pro (moved from Windows), I was looking for “best practice” suggestions.